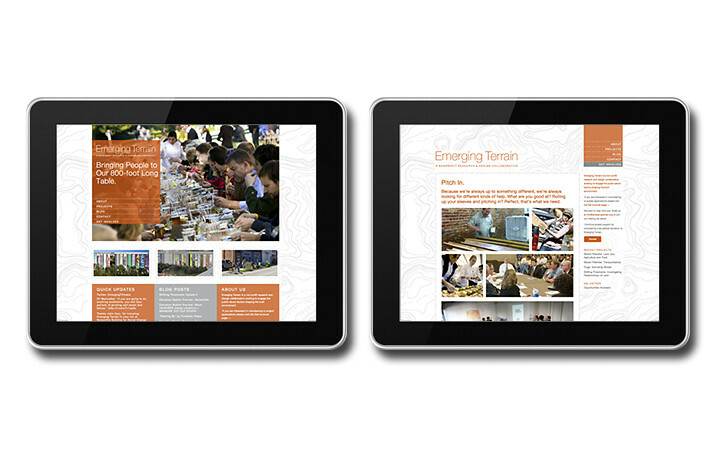 A website re-imagine brings clarity and accessibility to a fast growing organization. An emerging brand gains footing in the nonprofit terrain. Emerging Terrain is a non-profit research and design collaborative working to engage the public about factors shaping the built environment. This website refresh gave them a consistent identity on every device, and brought all their projects, events, blog and volunteer opportunities under one virtual roof. Emerging Terrain hit the ground running and grew faster than anyone could have imagined. Unfortunately, this led to some initial brand confusion. Many people had trouble differentiating Emerging Terrain, the parent organization, from Stored Potential, their wildly successful flagship project. 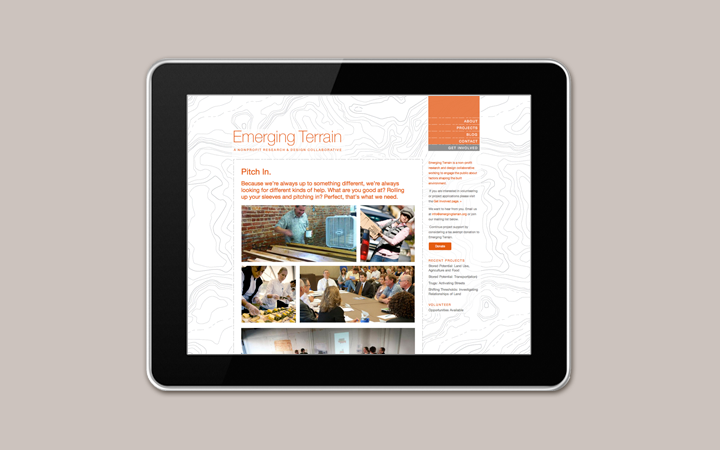 Emerging Terrain needed to re-imagine their web presence to underline their overarching organizational identity, to make the site accessible to mobile devices, and to house all facets of the organization in one place. The site also needed to be expandable to accommodate their continued growth. Finally, Emerging Terrain needed to be able to do the majority of their future updates internally. Utilizing a client friendly platform, we created a dynamic Word Press site that would do everything they needed and could grow with them into the foreseeable future. 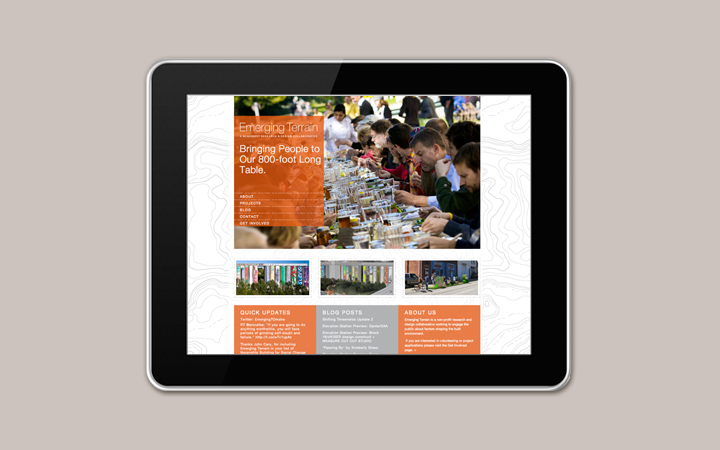 Expanding on the amazing branding work done by Oxide Design, we developed a dynamic and modern grid site that showcased the expansiveness of their ongoing projects with huge images and a map that showed the locations of their project. 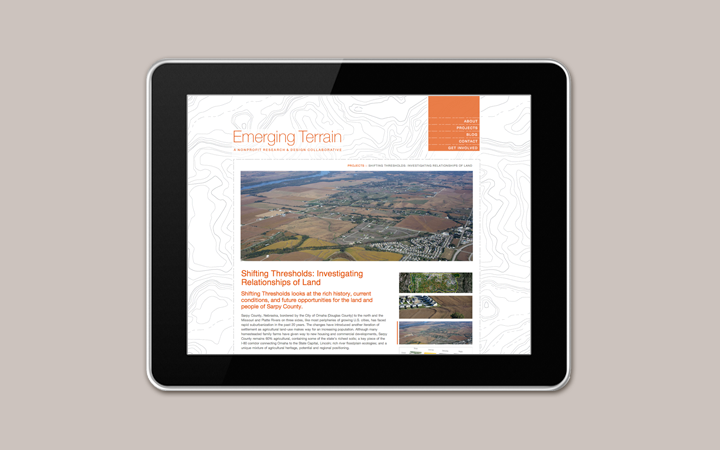 Emerging Terrain’s voice was added through detailed project descriptions and a blog. Now, donors and volunteers easily connect with the right people to keep the organization moving forward.